Kids releasing music covers on YouTube is nothing new. Many of these young artists have been able to parlay their internet fame into various successful projects and careers. Artists like MattyB Raps, Jacob Sartorius, and of course, Justin Bieber have risen to mega stardom based off their covers and original songs released on YouTube. JoJo Siwa is another one of these musicians and has cornered the market of preteen girls covered in glitter. Siwa has had a fairly long career by internet standards, coming to prominence on Season 2 of Abby Lee’s Ultimate Dance Competition in 2003. She is also known for her singles “Boomerang” and “Kid In A Candy Store”. Her song “High Top Shoes” has garnered over 20 million views on Youtube since its release in June of 2018. Lace up those glitter covered chucks. This song is all about how JoJo can’t be bogged down by the daily stresses of life. She simply blocks it all out and laces up her high top shoes. It’s a pretty positive message for kids, and it’s supplemented by a high energy beat and chorus. The hook consists of chanting about high top shoes, which also makes it easy for kids to sing along to. It’s an innocent track that plays well with its intended audience. JoJo and her backup dancers wear high top chucks in this music video. The music video focuses on Siwa’s day playing a variety of sports. It starts out with Siwa arriving at a Little League Field wearing a bright pink and neon green uniform. However, this isn’t nearly bright enough, so with a snap of her fingers, JoJo’s uniform is now bedazzled like a disco ball. She steps up to the plate to face off against fellow YouTuber Miranda Sings, who gives her a nasty stink eye. JoJo goes yard and wins the game for her team but both teams celebrate around her. The video then shifts to JoJo and her basketball team arriving at the gym for their game. 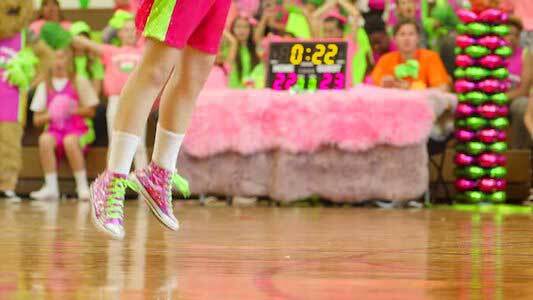 Most of the team can be seen wearing chucks, and Siwa herself is wearing a sparkling pair of bedazzled, pink high tops. Shockingly standing at 5’9”, Siwa seems to be a natural on the basketball court, raining down so many threes that the lights go out in the gym, and the game becomes a dance party. This music video is full of bright colors and light humor, and it fits directly in line with Siwa’s other major music videos. It’s also easy to see how this mixture of sights and sounds would grab the pre-teen girl demographic so well. This video fits with the high energy of the song, and shows off JoJo’s larger than life personality perfectly. Use the links below to get yourself a new pair of high top chucks.